At the foot of the Gavarres mountain range, and bordering the Baix Empordà one finds Cassà de la Selva, in the region of the Gironès (1). 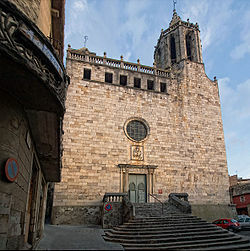 Located at a strategic point, communicating with Barcelona by road with the C-65 and 12 km from Girona, Cassà is 10 minutes from the international airport of Girona-Costa Brava (2). Agriculture, livestock and industry are the economic bases of this locality of the Gironès (3). Culture and natural spaces go hand in hand in this singular location, where lovers of history and natural scenery will find the ideal place to learn and disconnect. Two extremely original museums allow one to discover the cultural wealth of Cassà: The Catalonia Postcard Museum (which goes all over the country through the images of postcards from the last 150 years) and the Cassà Contemporary Art Park (a unique collection of art in the open air). Halfway between the products of the sea and those of the earth, the cuisine of Cassà is a faithful heir to Catalan gastronomy, and as could not be any other way, that of the regions of the Gironès. However, signature cuisine also has its place, along with numerous fairs, festivals and markets dedicated to the art of eating well such as the Fira de la Caça (the Game Fair).